Compressive strength of unmodified concrete and mortars can continue to increase slowly after the initial curing period. However, other physical properties are reduced as the concrete or mortar ages. 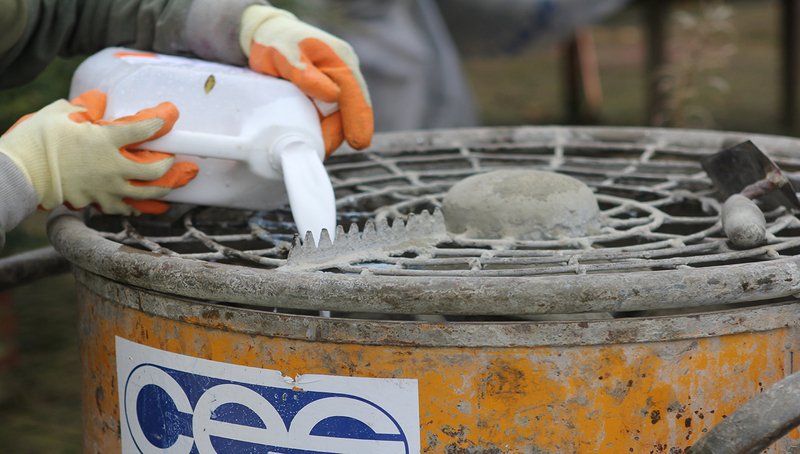 Published independent data relating to the effect of ageing on cementitious mortars is scarce. But testing of compressive strength, tensile strength and elastic modulus has been conducted on samples taken from 23-30 year old concrete. The results indicated that capacity to withstand loads degraded with age. Testing of samples showed that ductility was reduced, with elastic modulus increased by approximately 30%. 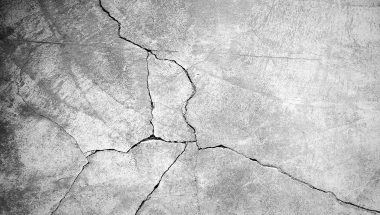 Embrittlement of the concrete meant that its resistance to tensile stress was reduced by up to 50% compared to new concrete. 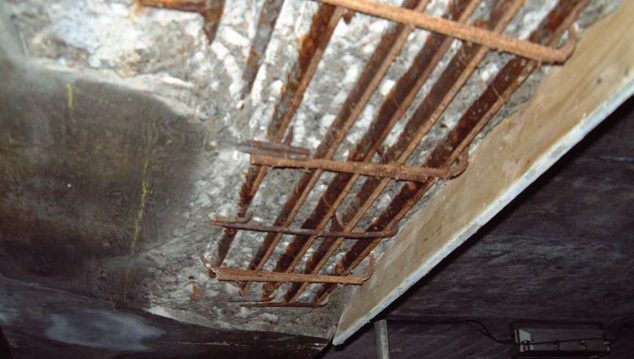 The expectation of the researchers was that this degradation would continue to worsen over decades; reducing the capacity of the concrete to withstand tensile and shear loads. Polymer modification of cementitious mortars is an accepted method for improving the physical properties of mortars. Screeds, renders, concrete repair, bedding and other applications requiring durable high strength mortars. Polymer modification may improve compressive strength to some extent because of the reduced water demand. However compressive strength should be adequate in most cases without polymer modification. The compressive strength of mortar with a polymer cement ratio of approximately 1:7 will be lower than the compressive strength of mortar with a polymer cement ratio of approximately 1:10. The reduction comes with considerable gains in flexural and tensile strength. Compressive modulus is also reduced in mortars with high polymer contents, reducing stress on the bond between mortar and weaker substrates. The greatest strength gains in polymer modified mortars are in tensile and flexural strength. This allows thinner screeds to be laid. This reduces the risk of cracking caused by tensile and flexural stress in screeds, concrete repairs and renders. 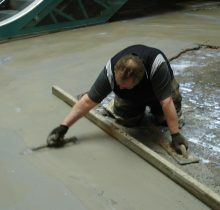 Wear resistance, which is generally poor in traditional screeds, is also improved by polymer modification. 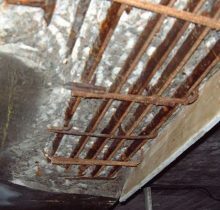 The capillary pores in cementitious mortars produced in accordance with Ronafix mix designs, particularly those with a Ronafix content of ≥ 9 litres per 50kg Portland cement are narrower and have fewer connections to other pores than in unmodified mortars with the same proportions of sand and cement and the same water: cement ratio. This considerably reduces the permeability of Ronafix modified mortars to liquid water, moisture vapour and acidic gases. Permeability is low or extremely low, depending on the mix design. This makes Ronafix mix designs waterproof or weatherproof, resistant to carbonation and very resistant to damage by freeze thaw cycling. Typical shrinkage of Ronafix modified mortars with a Ronafix content of ≥ 9 litres per 50kg Portland cement is 0.01%. This is similar to that of epoxy resins. 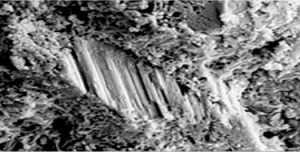 The image shows a microscopic view of a polymer modified mortar with many of the voids filled in. The addition of Ronafix admixture to sand/ cement mortars improves physical properties during the curing period and in the longer term. Flexural and tensile strengths are considerably increased and the reduced water cement ratios of Ronafix modified mortars will in many cases improve compressive strength. The rate of increase in physical properties of polymer modified samples tested beyond the initial 28 day curing period is greater than increases in unmodified samples. Heat ageing testing indicates that after simulated life of 20 years, tensile strength of Ronafix modified samples was similar to unaged samples and after 40 years of simulated ageing, tensile strength was reduced by 14%. At the same age, tensile strengths of unmodified control samples were unmeasurably low. After 260 years simulated ageing, tensile strength of Ronafix modified samples was 34% lower than unaged samples but similar to tensile strength of samples tested after 80 years ageing, indicating that reduction in tensile strength had stopped. Heat aged samples subjected to flexural strength testing showed that after 40 years accelerated ageing, flexural strength of Ronafix modified samples had increased by nearly 50% while unmodified samples had lost approximately 30% and were 68% lower than the flexural strength of Ronafix modified samples. After 260 years simulated ageing, flexural strength of Ronafix modified samples was 9% lower than the 40 year aged samples. It was also considerably higher than samples tested after 20 years simulated ageing. Ronafix mix designs dry faster than unmodified mortars, when tested in the laboratory at 50mm thicknes. 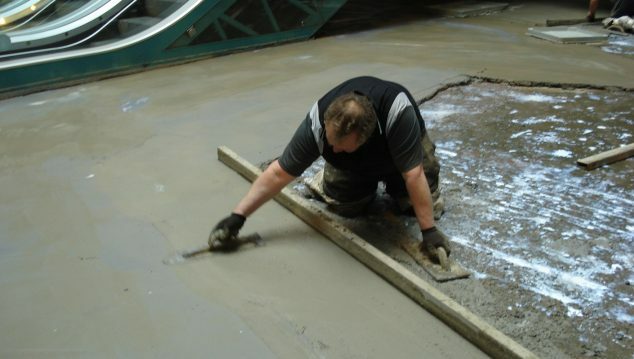 Ronafix polymer modified screed mix designs achieve 75% relative humidity at the screed surface after approximately 10 days of air curing when cured at 200C and approximately 60-65% relative humidity. In general 75% relative humidity at the surface indicates that the screed is sufficiently dry for application of resilient floorings; carpet, quarry tiles, ceramic tiles and stone tiles. The typical drying time of unmodified mortars in the same drying conditions is 50 days.